You know the drill: Stack the odds against veteran IMF agent Ethan Hunt and dangle him from a wire in a room or building no one’s supposed to be able to infiltrate. Have some clandestine evil threaten the global balance of power while Hunt’s own superiors disavow knowledge of his efforts to stop it. Yes, Tom Cruise is back for MISSION: IMPOSSIBLE – GHOST PROTOCOL, the third sequel to the 1996 film adaptation of the popular sixties spy program. In case you’d forgotten, the first MISSION (directed by Brian DePalma) had Hunt ferreting IMF moles to clear his name after a botched operation in Prague kills his entire team. The second MISSION (directed by action guru John Woo) followed Ethan in a race against time to secure an antidote for a lethal virus. M:I:III (directed by "Bad Robot" J.J. Abrams) called Hunt out of semi-retirement to stop a black market arms dealer who kidnaps his fiancée. Each film boasts at least one memorable set piece wherein a heavily-harnessed Hunt rappels, jumps, or is lowered into peril—like a spider on a silken strand. Rather than go back to formula, GHOST PROTOCOL shakes it up—like a pressurized can of soda—by suspending X-Treme actor Cruise outside the world’s tallest building. We’ve seen bits of this ballsy vertigo-inducing sequence in trailers, and I’m sure others besides me wondered, “Cool! But is there a decent popcorn movie behind all this?” Indeed there is. Starting with a bodacious prison break and climaxing with a bone-crushing, beat-the-clock fistfight in an automated parking garage, GHOST PROTOCOL brims with breathless action beyond the glass panes of the stratospheric Burj. There’s nary any character development or psychological gravitas—but who has time for that when a madman’s about to launch the ICBM that will herald WWIII? Hunt and his ragtag team go rogue after they’re framed for a bombing at the Kremlin; tension between Washington and Moscow hasn’t been this hot since the Cuban missile crisis. Ethan’s boss serendipitously turns up in Red Square to inform him they’re on their own, but things are so hectic that even this cursory, dead-of-night car rendezvous is interrupted by gunfire. Between the real terrorists and the Russian authorities (who think Hunt is their culprit), our heroes have their work cut out for them: Stop Goldfinger…er, Hendricks (Michael Nyqvist) before he taps into a forgotten Cold War satellite with his stolen missile code. Failure means the incipient vaporization of millions of Americans and possible nuclear Armageddon; the U.S. will assume its old enemy has retaliated for the Kremlin attack and launch a counterstrike. Tech-savvy Benji Dunn (Simon Pegg), sultry Jane Carter (Paula Patton), and mysterious “analyst” Brandt (Jeremy Renner) help Ethan stage a subterfuge in Dubai that leads to the harrowing highlight—Cruise’s skywalk outside the 130th floor of the majestic Burj Khalifa—and a gripping footrace (and car chase) through a sandstorm. Director Brad Bird (IRON GIANT, THE INCREDIBLES) acquits himself marvelously in his first-ever live actioner, applying McCarthy-era fears and a comic book sense of hyperrealism to a convincing, post-911 espionage thriller with results that’ll leave theatre floors littered with cuticles. Shot partly in IMAX, the loud-but-visually stunning adventure contains wondrous, panoramic overviews of exotic locales (Budapest, Mumbai, San Francisco) and their distinctive architectures. The dizzying aerial cinematography in and around the Burj Khalifa will have viewers gripping their armrests to make sure they’re still safely grounded; think DIE HARD’s Nakatomi Tower gone exponential (Cruise goes barefoot during another gambit). The writers ramp the wow factor with plenty of 007-inspired gadgets—including a camera-eye contact lens, a prosthetic arm, magnetic suit, electrostatic sticky-gloves, and a nifty iPad-powered screen that simulates interior environments. They didn’t forgo the funny, either; Pegg delivers a couple deadpanned punch-lines that counterweight Ethan’s steely seriousness quite nicely. The story also gives nods to the TV series of old, with references to a criminal “Syndicate,” and an outdated IMF telephone that doesn’t self-destruct in five seconds, prompting Hunt to give it a Fonzie fist-thwack. The levity keeps us from bailing when Hunt’s roller coaster-crusade clatters between explosive crests. On the downside, the picture lacks a sense of personal involvement on the part of the secret agents. Without Philip Seymour-Hoffman endangering his wife, Ethan comports himself with a cool, calculating detachment that allows him to sustain brutal, repeated drubbings without the concomitant injuries. 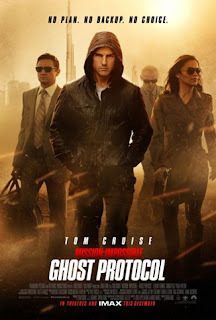 GHOST PROTOCOL finds the near-50 year old in full-on TERMINATOR mode—running, jumping, kicking, and punching without getting too winded—yet one ponders why Hunt and his fugitive friends don’t just walk away from the job. It’s actually a relief when we’re afforded glimpses of Ethan’s humanity, like when his jaw drops with incredulity upon learning he must scale the Burj to access a computer server. Patton’s secret agent is smolderingly attractive, if shallowly drawn; her backstory involves little more than a murdered paramour. But Renner manages some depth with his guilt-ridden operative-turned-bureaucrat. It’ll be interesting to see how much maneuvering room he’s afforded as THE AVENGERS’ expert archer, Hawkeye. 3 out of 4 stars.